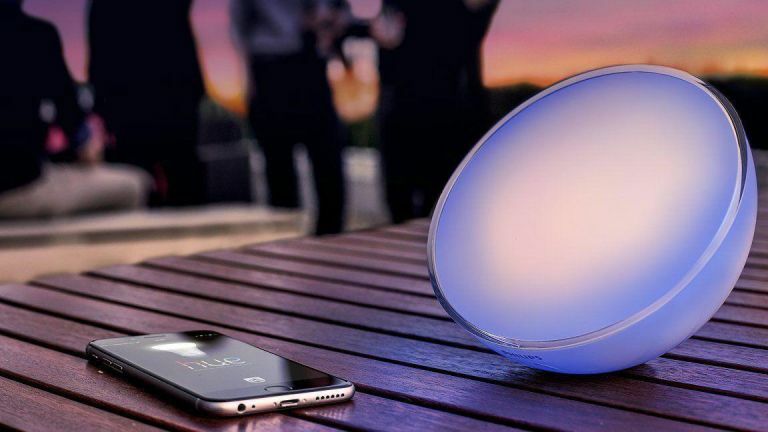 The Philips Hue Go has a contemporary look that you either love or hate. It's portable but with a battery life of just three hours, you need to charge it regularly. At around £70, it’s not cheap, but we love the Hue functionality. You can ask your smart speaker to initiate particular lighting routines or change the colour of the light. You can turn the light on from the app on your phone – even when you're out. You can set it to slowly get brighter, waking you up gently in the morning. If you don’t own a Hue Bridge you’ll lose out on the smart features and just have a normal light. Tricky to stand up while it's charging. Chances are you've heard of Philips Hue, the smart lighting system that allows you to take control of the way you illuminate your home, no matter where you are on the planet, as well as making interacting with your lights when you are at home easier than ever. Having reviewed the Philips Hue Starter Kit (which you're welcome to have a read of) TechRadar's James Peckham now turns his attention to another popular product in the Philips range: the Philips Hue Go. How does it stand up to scrutiny – and how could you use yours at home? Not sure what you should be looking for when it comes to smart lighting? Our guide to the best smart lighting gadgets to light your home was designed with you in mind. You'll find plenty more reviews and buying guides over on our technology hub page, too. What is the Philips Go? This isn’t a light bulb that will connect into your existing sockets around your home, like in the Starter Kit. Instead, this is a standalone lamp that you can buy to have separately and it’s portable so you can take it away from where you normally keep it. Below I’ll run through all the design, price and smart features you’ll need to know about if you’re considering buying the Philips Hue Go, as well as my verdict on whether it’s made for you. The Philips Hue Go has a dramatically different design to a lot of the other products in the Hue range, which usually attempt to hide away as they look like normal light bulbs or thin strip lighting. The Hue Go is a large circular light that’s unashamedly bold. It’s a circular device that I like the look of, and it’s designed to especially fit in on a bedside table or on a side table in your living room. I've had people question the look of the light as it stands out when compared to just your average household lamp. The rear of the light is rounded, but there’s a small lip at the back of the device that you can use to stand it up. I found this to be a touch frustrating as where you plug in the power cable is just below the lip, meaning you can’t stand the light up when you’ve got it on charge. It did further encourage me to use the light without the power cable though, reminding us that this is a portable light after all. It’ll last for three hours on maximum brightness, which isn’t particularly impressive when you consider some other lighting options on the market. Like the rest of the Philips Hue range, you’ve got the choice of 30 million different colours. You’re not going to use all of those shades, but it gives you lots of choices when deciding on a colour within the palette included on the app. There’s a button on the rear of the device that I found to be an easy way to control the light. It’ll turn on from a single press, or you can cycle through a variety of options including dynamic light effects, a warm white colour and a selection of other shades including blue and green. My favourite feature comes when you pair the Philips Hue Go with a smart speaker though, but you’ll need to own a Philips Hue Bridge to be able to do that. That’s something that’s included in the Philips Hue Starter Kit, or you can buy it separately and it’ll open up a world of smart features. It’s worth making clear here, if you don’t own a Hue Bridge you’ll lose out on the smart features of the Philips Hue Go and instead you’ll just have a normal light. Read more about our pick of the best smart speakers. Pairing the Go with a Hue Bridge means you can control the light from your Amazon Alexa or Google Assistant (both os which we've reviewed) or Apple Siri sporting smart speaker as well as through an app on your iPhone or Android device. We’d heartily recommend connecting it to both as it makes the Philips Hue Go a much more accessible and feature-packed product rather than just a singular light that will work on your bedside table when you press the button. Once you’re set up you can ask your smart speaker to initiate particular lighting routines, or you can ask it to just change the colour of the light in your room, make the light warmer or just turn it off altogether. Doing that with your voice is a joy, especially for the first few times you get to do it. One of our favourite features is the fact you can turn the light on from the app on your phone, which means you can even turn your lights on from the car when you get home on a winter’s night. It also means you can make it look like someone is living in your home when you’re away in an attempt to deter burglars. The fact the light can display 30 million colours is difficult to comprehend too. You can either ask your smart speaker for a generic colour, or you can find an exact shade using the colour palette functionality within the app on your phone. If you’re looking for a very specific shade, you’ll want to use the app. Once you’ve found a colour, you can save it as a favourite and in the future you’ll be able to activate it on the smart speaker by saying the name you saved it as. The app also allows you to set up routines for the light so you can schedule it to work like an alarm slowly getting brighter to wake you up on a morning. The Philips Hue Go isn’t the most attractive product in the Hue range, and it doesn’t disappear into your furnishings and hide itself away like some products in the family. If you’re looking for a bedside lamp, or you don’t mind the design, this likely won’t be a problem. With a battery life of three hours, we’re not convinced this is particularly portable for long trips away, but it’s lovely to have the option there if you remember that you’ll need to charge it up after a few hours of use. At around £70, it’s one of the more expensive options for a portable smart light but it works well and comes with all of the Hue functionality we’ve come to love. The smart features are where the Philips Hue Go particularly excels. We love the fact you can control it easily with your voice, as well as the controls within the phone app, and the buttons on the back of the device make it easy for you to quickly cycle through a variety of different modes too. Looking for more expert tech reviews?